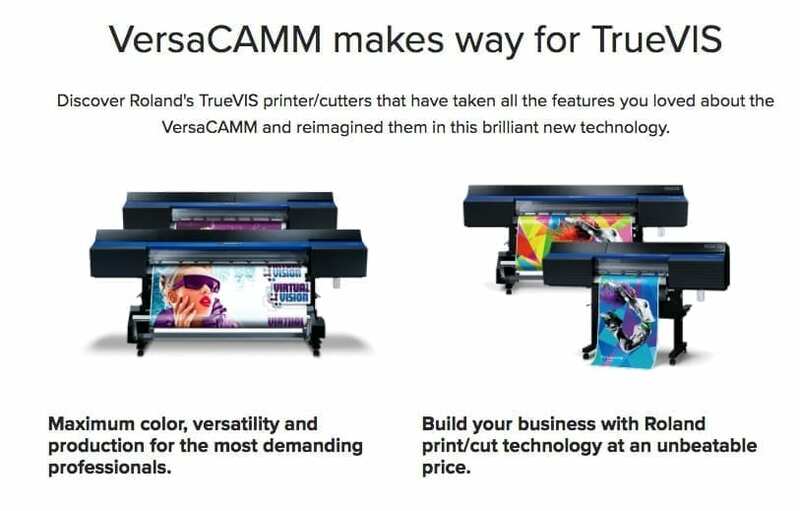 The VersaCAMM VSi Series offers businesses everything you need to produce just about any print job imaginable. Featuring gold plated print technology and high-performance ECO-SOL MAX inks, with White, Metallic and Light Black ink options, to deliver exceptional print quality. Integrated contour-cutting is simple for a streamlined production process; and a range of user-friendly design features to boost efficiency are included. The VersaCAMM VSi series is the ideal device to build your business on. Available in 64-inch, 54-inch or 30-inch models, the VS-i Series wide-format inkjet printers produce vibrant graphics across a wide range of applications, including signs, banners, vehicle graphics and wraps, fine art posters, packaging prototypes, labels, decals, POP displays and apparel heat transfers. Includes VersaWorks RIP software. Latest features include built-in PANTONE® spot colour library and predictive ink usage calculator and alert. Includes Roland OnSupport™ for unattended monitoring of the printer. Included items Exclusive stands, power cord, blade, blade holder, media clamps, media holder, replacement blade for separating knife, user's manual, etc. Enter your details below to get the latest pricing for the Roland range, or call us on 0118 934 4426 to speak to us directly.